The Yakovlev Yak-42 (NATO reporting name: Clobber) is a 100/120-seat three-engined mid-range passenger jet. It was designed as a replacement for several obsolete Aeroflot jets as a mid-range passenger jet. It was also the first airliner produced in the Soviet Union to be powered by modern high-bypass turbofan engines. The Yak-42 was designed as a replacement for several earlier Aeroflot aircraft, including the twin-engined Tupolev Tu-134, An-24 and An-26, and the Il-18, as well as various smaller aircraft serving routes experiencing significant growth, and where airports and runways had been expanded to accommodate a more advanced aircraft. To meet this requirement Yakovlev developed the largest, heaviest, and most powerful aircraft it had ever designed. To save design time Yakovlev conducted a detailed study of all foreign aircraft in the same category. In addition, an unprecedented amount of research was performed by Yakovlev as well as CAHI and CIAM, as well as other organizations to support the program. A major manufacturing plan was drawn up under which the aircraft was to have parts constructed at Saratov, with final assembly at Smolensk, in reverse of the Yak-40 program. The project started with a scaled-up Yak-40 with an unswept wing, and seating for 114 passengers in nineteen rows of three plus three. This design was soon rejected as uncompetitive with western counterparts. In addition, western aircraft were now employing high-bypass turbofan engines, and the decision was made to introduce a similar engine to the new aircraft. As a result, at Zaporozhye Vladimire Lotarev designed a three-shaft engine with a bypass ratio of 5.4/5.6 specifically for the Yak-42. In late 1972 Yakovlev decided to place three of the engines on the aircraft, as had been done with the Yak-40 (he was also influenced by the Boeing 727 and Hawker Siddeley Trident). Lotarev designed the new engine, designated D-36, to deliver 6,500 kg (14,330lb) of thrust. The full-scale mock-up was revealed to western aviation writers in June 1973. It was essentially a greatly enlarged Yak-40 with 120 seats in twenty rows of three plus three. Compared with the Yak-40 the Yak-42 was roughly four times as heavy, and would require a much larger and better developed runway. Considerable debate took place over the sweep back of the wings. As a result the first prototype was built with an 11-degree sweep, while the second prototype possessed a 25-degree sweep, that was later changed to 23-degrees before its first flight. The pressurized fuselage had a circular diameter of 3.8m (149 5/8in). Like the Yak-40 it was of simple ring/stringer construction and was semi-monocoque. Also like the Yak-40 it was designed with an expected lifespan of 30,000 one-hour flights. Unlike the Yak-40 the passenger compartment extended back behind the wing, though the rear fuselage was very similar. Also like the Yak-40, the aft pressure bulkhead incorporated the main cabin door, which led to powered airstairs which hinged down under the tail. The side engines were attached quite high on the fuselage, with short fan ducts and initially no reversers. Again like the Yak-40, the number 2 (center) was fed by an S-duct. 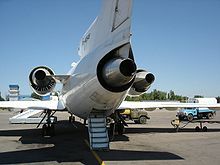 The center engine fairing extended back over the TA-12 APU (auxiliary power unit), which provided compressed air to start the engines and also ground cabin air-conditioning, giving the Yak-42 the same ability to operate independent of airport facilities that the earlier Yak-40 enjoyed. The large fin housed the one-piece rudder. At the top of the fin was the fully-powered tailplane, with a span of 10.8m (35ft 5in). The prototype had a bullet fairing extending from the front of the tailplane, but this was removed from series production. Unlike the Yak-40, the tailplane extended to the forward edge of the fin. The undercarriage also experienced revision, with the prototype possessing a single large tire on each main unit, while production aircraft incorporated a bogie with four tires similar in size to the nose wheel. The main gear retracted inward, while the nose wheel retracted forward. All wheels were equipped with the latest multi-disc brakes with anti-skid control. The passenger cabin had an interior diameter of 3.6m (11ft 9 3/4in), while height along the center aisle was 2.03m (6ft 8in). Functional length behind the cockpit was 19.89m (65ft 3in). The fuselage had twenty windows on each side, four housing emergency escapes. In addition to the rear airstair there was an additional airstair located on the forward left side, and a service door opposite. Allowing for galley and toilets early aircraft were designed for 100 seats. Cargo and baggage holds were located under the floor with doors on the right side, and on series aircraft, six chain conveyors in the forward hold and two in the rear for moving standard containers. The cockpit seated the two crew members, and included a SAU-42 autopilot, with advanced avionics and radar. The overall avionics packaged was designed with the goal of landing in bad weather on an unpaved runway measuring 30 by 400m (98 by 1,312ft). As of late 1995 this goal had still not been achieved. All fuel storage was inside the main wings. In prototypes and early series aircraft the capacity was 15,795 liters (3,474.4 gallons). In 1981 this was increased to 23,175 liters (5,098 gallons). The first prototype was built at the Yakovlev prototype factory (previously Factory No. 115), and painted in the company's traditional red and white color scheme. It was registered SSSR-1974, and first flew on 7 March 1975, the crew being Yakovlev test pilots A S Kolosov and Yu B Viskovskii. This aircraft was unique in having an 11-degree sweep back to the wing, a shorter fuselage with seventeen windows on each side with the emergency escapes all positioned in the rear, a tail bullet fairing, and twin main tires. Several systems, such as the de-icers, were inoperative. The second prototype was registered SSSR-1975. It possessed a longer cabin with the emergency escapes positioned further forward, and had a wing sweep of 25-degrees. The third prototype was No. 1976. This aircraft was later re-registered as a series aircraft under No. 42303. It featured a 23-degree sweep to the wing, full de-icing equipment, fairing discs over the main wheel wells, and other minor changes. It retained the tailplane bullet. No. 42303 was reguarded as the first true series aircraft, though changes would continue during production. One of the first changes adopted was the removal of the tailplane bullet, while another was a minor redesign of the wingtip giving it a slight upward (Kuchemann) curve which slightly increased wingspan. Weights increased substantially as the fuel capacity increased, and the bogie style undercarriage was made standard. Initial aircraft were fitted for 120 seats in a three-plus-three arrangement. This was soon changed to a first class section with two-plus-two seating, and a main cabin with ninety six seats, giving a total of 104 seats. An evaluation of the first series aircraft in 1977 by "Flight International" magazine suggested that in comparison to western aircraft the Yak-42 appeared to be grossly over-winged and over-powered in order to reduce field length. The journal predicted that the aircraft would enter service with Aeroflot "by the beginning of next year at the latest". In reality, the first scheduled passenger flight of a Yak-42, on the Moscow-Krasnodar route, did not take place until 22 December 1980. By that time full series production had only just started, with only ten aircraft completed at Saratov and flown by mid-1981, the year in which Yakovlev test pilot Mukhin set several class records in the aircraft. Almost 100 had been delivered by 1993. In 1982, shortly after the type's introduction into commercial service, an accident caused by vibrations in the tail section of the aircraft forced a prolonged suspension of the type's operation. In October 1984 the aircraft was cautiously returned to service between Saratov (a Yak-42 factory) and Leningrad and Moscow Bykovo. After the necessary modifications were made, the Yak-42 re-entered service in the Soviet Union circa 1985. An export order for seven aircraft was announced in 1982 by Aviogenex of Yugoslavia, but the contract lapsed. Only after the political fall of the former Soviet Union were a few Yak-42s constructed for carriers in Africa, China (8, including 6 Yak-42D), Cuba (4), Pakistan, and in former Yugoslavia. Version with AlliedSignal avionics. One test aircraft built. Version using AlliedSignal avionics. Eventually developed into the Yak-142. Planned version using Bendix/King avionics. Longer-range version with additional fuel tanks located in the center fuselage, adding 3,100 liters (682 gallons), also described as having better service characteristics. Beginning in 1991 the Yak-42D became the standard series production version, produced at Saratov by the newly-formed Skorost Corporation. As of 1 January 1995 a total of 185 Yak-42 had been produced, including 105 Yak-42D. This figure includes four aircraft built for Cuba, and eight (six Yak-42D) for China. In the second special conversion of a Yak-42, aircraft No. RA-42644 was equipped for geophysical survey work. Additions included high-definition electro-optical sensors in large cylindrical pods under each wing just outboard of the undercarriage, the front portion rotating to bring the terrain below into view. The first major conversion of a Yak-42 was made to aircraft RA-42525 for flight testing of the D-236 geared turboprop engine. The engine, rated at 8,090kW (10,850shp) was derived from the D-36 turbofan used on the Yak-42. The test engine was mounted on the aircraft on the starboard side in place of engine No. 3. A new pylon was needed to accomidate the 4.2m (13ft 91/2in) SV-36 contra-rotating tractor propellers, the front unit having eight blades and the rear six. The Yak-42LL was first flown on 15 March 1991, and exhibited at the Paris Air Show three months later as the Yak-42E-LL. A projected stretched version expected to enter service in 1987. Changes included the use of D-436 engines, increased fuel capacity, a 4.5m (14ft 9in) plug added to the fuselage to increase seating capacity to 156 to 168 seats, and a maximum takeoff weight of 66,000 kg (145,505lb). By 1991 this design had modified several times, including the addition of PS-90 turbofans, and was eventually redesignated Yak-242 (described later). Version produced for international routes, differing only in minor equipment and furnishing details, including multiple languages posted for passenger notices and servicing engineers. This version entered service in July 1981 on the Leningrad-Helsinki route. Yakovlev-ordered conversion of three aircraft from 1986 to 1990 for flight-testing the radar of the Yak-141. The Yak-42T was a proposed STOL cargo version with an unswept wing, large rear ramp door, a twin-fin tail, and the center (No. 2) engine being placed in a short nacelle directly on top of the rear fuselage. This was the first version planned to have the bogie-style main undercarriage, which would have retracted backward into Tupolev-style nacelles. Later drawings show the main gear retracting inwards, and the designation changed to Yak-44, which was later re-used for a different aircraft. The Yak-142 was Yak-42 No. RA-42423, which was completed as a prototype for a significantly upgraded version initially designated the Yak-42A (see variants). A year later this aircraft was redesignated the Yak-142. It incorporated a number of important improvements including new spoilers designed for faster letdowns, and improved flaps for better takeoff and go-around climbing. The side cabin door was enlarged to accomidate airbridges. The completely new cockpit included all new AlliedSignal avionics, while the Russian SAU-4201 autopilot incorporated autothrottle. The cabin accomidations were improved, and increased soundproofing was added. Standard seating was for 120 in one class, or 83 first class and 104 coach seats. The aircraft entered production at Saratov on a limited basis. The Yak-242 was a planned design but never got beyond the drawing board. Instead, the MS-21 is essentially an improved version of the Yak-242 and is to be built by 2012. As of 6 August 2010, a total of 60 Yakovlev Yak-42 aircraft remain in airline service. As of 2009 the planned production run of 2,000 aircraft had come up roughly 1,800 aircraft short. Compared to the earlier, extremely successful Yak-40, the Yak-42 was a financial failure. The Yak-42 suffered from excessively long production delays, with constant improvements and modifications ruining any chance the design had for making a profit. The Yak-42's main claim to fame is that it is the largest, heaviest, and most powerful Yakovlev design ever to enter production. As of 4 September 2009 eight Yak-42 accidents are responsible for 548 deaths. Taylor, Michael J. H. Brassey's World Aircraft & Systems Directory 1999/2000. London: Brassey's, 1999. ISBN 1 85753 245 7.